We’ve been recently discussing the Jeep Grand Wagoneer over on TTAC, which has reminded me of a very unusual used car: the second-generation Jeep Grand Wagoneer. No, I’m not talking about the various facelifted and updated versions of the original Grand Wagoneer, which came out in the 1960s and used the same outdated chassis for decades. I am instead referring to the 1993 Grand Wagoneer, which was really just a rebadged Grand Cherokee. Here’s what happened: when Chrysler ditched the Grand Wagoneer in the early 1990s, they were highly afraid of losing loyal customers. That makes sense, as many Grand Wagoneer owners were old-money car shoppers who really didn’t want anything else. So, to keep things familiar when the Grand Cherokee came out, Jeep created a trim level designed to capture Grand Wagoneer buyers. It was, quite simply, the Jeep Grand Wagoneer, even though it was actually just a Grand Cherokee with wood on the side. The result of this was that, like many Chrysler rebadges, precisely no one was fooled. The Grand Wagoneer sold in tremendously small numbers, and I don’t remember the last time I actually saw one on the road. But it didn’t matter: the Grand Cherokee was such a success that Jeep sort of forgot about those high-end Grand Wagoneer buyers it once owned. In turn, they forgot about Jeep, instead buying the Land Rover Defender (or just a refurbished Grand Wagoneer) in the ensuing years. 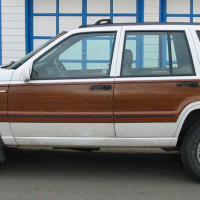 But if you ever see a first-gen Grand Cherokee with wood on the side, remember: it isn’t a Grand Cherokee, but rather a Grand Wagoneer. And it’s definitely a 1993. Meh.. This does nothing for me. I loved the old Wagoneers (along with every other gas chugging old money SUV…) as well as the ZJ and WJ Grand Cherokee s, but combining the two was unnecessary. Did you know the early ZJ (maybe 93-95) could be equipped with a 5-speed?? Take your pick Doug: 93 GC or 95 Disco with a 5-speed. No! I never knew that! To Craigslist!!! The ’93 Grand Wagoneer had the 5.2L V8 and 4-speed automatic standard. In ’93, you could get the Base or Laredo with 5-speed manual but only with the 4.0L I-6 and 4-wheel drive. In ’94, the Base became known as the SE model and it also was available with 5-speed manual on the 4-wheel drive 4.0L model. The 5-speed manual was dropped for ’95 due to very slow sales. Technically, there was no Laredo model in ’94 or ’95, just SE and Limited. The ‘Laredo Package’ was an option on the SE (and it accounted for at least 75% of total sales). The Base and SE versions were very easy to spot because they lacked the lower body cladding (gray on Laredo and body-color on Limited) and looked incredibly plain and cheap. They also had steel wheels, which was pretty ridiculous considering that the ’94 SE 4×2 had a base price of $22k! I’ve never driven a JGC with 5-speed manual, but a friend had a ’96 Cherokee Sport 4×2 with the 4.0L and 5-speed manual. It was probably the second worst manual transmission I’ve ever experienced. The first (worst) prize goes to the same friend’s first car- a 1984 Chrysler Laser XE Turbo….Chrysler’s crappy 3-speed automatic would have been a dream in comparison! All of the 4.0 I6 ZJs can be retrofitted with the 5-speed manual. The biggest difficulty is sourcing a center console to surround the shift tower. It most def did come with a 5spd. Same gear selector (a piece of metal, rubber boot, and a polished nob) as in the Cherokee Sport. I actually have seen one. Red, cloth interior, 5spd CommandTrac. Incidentally, I owned of those less rare 5spd Cherokee Sports. Chili Pepper Red, classic wheels, but optioned with the upmarket radio and fog lights. Loved that truck. Was ridiculously fast for what it was and put some really hard miles on it. Too fun. Don’t forget the XJ based “Wagoneer”. The G-Waggy was such a cash Cow for Jeep/Ma Mopar that they’d try anything to milk a bit more from that name. I’ve seen a few of those GC with the wood around Metro Detroit, but never realized it was “seperate model” from the regular GC. I figured it was just a tacky dealer add-on! I own a 93 Grand Wagoneer ZJ. Love it. I get plenty of looks driving around my city.